Thanks to the new Geoloqi module, developers can now create geo-triggered events in their applications. This, says Appcelerator, will allow its developers to create apps that make use of geofencing and can, for example, send users a push notification when they cross the border into or out of a geofenced zone. 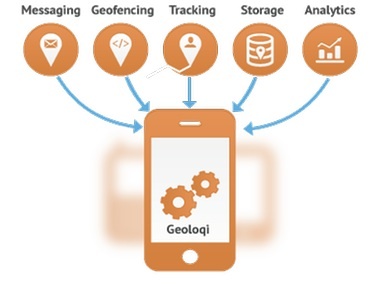 In addition, Geoloqi offers standard location tracking features as well as location analytics. While the company’s partnership with Appcelerator focused on these areas, Titanium developers will also be able to use Geoloqi’s other features, including, for example, its Wikipedia layers. Appcelerator tells us that it also chose Geoloqi because it can smoothly transition between different location sources like GPS and WiFi triangulation, relatively conservative battery use and also because it features sophisticated privacy controls for users. Appcelerator, as its head of Head of ISV and ecosystem partnerships Spencer Chen told me at TechCrunch Disrupt earlier today, is looking to partner with forward-looking companies that can offer best-of-breed services to its users. Just last week, Appcelerator also announced a partnership with leading mobile ad network InMobi. About 70% of the company’s users, said Chen, currently develop consumer-focused applications like Hotel Tonight and the other 30% are working on apps mostly used internally in large enterprises. The company’s new COO Sandeep Johri was, among other things, responsible for implementing the overall strategy for HP’s enterprise business, so chances are that the company will continue to push even deeper into the enterprise market in the near future. Appcelerator is offering developers who sign up for the Geoloqi module before June 30, 2012 a free two-month trial of Geoloqi. After that, plans will start at $19.99 per month.